Savoy Ballroom. Originally located at 596 Lenox Avenue, between West 140th Street and West 141st Street, Harlem, New York. 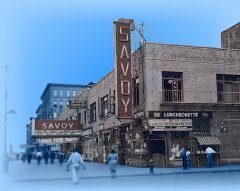 The Savoy was opened on March 12, 1926 by Moe Gale (Moses Galewski), Charles Galewski, and a Harlem real estate businessman called Charles Buchanan, who functioned as the ballroom's manager. The Savoy was billed as the world's most beautiful ballroom; it occupied the second floor of a building that extended along the whole block between 140th and 141st streets, and featured a large dance floor (200 feet by 50 feet), two bandstands, and a retractable stage. It swiftly became the most popular dance venue in Harlem, and many of the jazz dance crazes of the 1920s and 1930s originated there; it enjoyed a long and glittering career that lasted well into the 1950s, before a decline in its fortunes set in. On its opening night the Savoy featured Fess Williams and his Royal Flush Orchestra, the Charleston Bearcats, fronted by Leon Abbey, and, as a guest band, Fletcher Henderson's Roseland Orchestra; the Charleston Bearcats formed a lasting connection with the venue and later changed its name to the Savoy Bearcats. Except on special occasions, the ballroom engaged two bands, which played alternate sets, and this policy led to its becoming a famous venue for battles of bands. Elaborate events of this kind were also organized by the management: on May 15, 1927 the Savoy presented a "Battle of Jazz," which featured King Oliver's Dixie Syncopators, a band led by Williams, Chick Webb's Harlem Stompers, and Henderson's Roseland Orchestra; other battles were fought between bands led by Lloyd Scott, Webb, Alex Johnson, Charlie Johnson, Williams, and Henderson (May 6, 1928) and between Cab Calloway's Missourians and groups led by Duke Ellington, Henderson, Cecil Scott, Lockwood Lewis, and Webb (May 14, 1930). In the late 1920's in Harlem, New York, Lindy Hop was breaking out wherever people were partying... But it wasn't until the opening of the Savoy Ballroom that Lindy Hop got its name and a home. At the Savoy, the Lindy Hop got hotter and hotter, as people danced to the top Big Bands in the land. And it got better and better, as the popular Saturday night competitions pushed good dancers to greatness. New steps were born every day. The styling got refined and was executed so well that the dance was a joy to watch as well as do. When it looked like it couldn't get any better, a young dancer named Frankie "Musclehead" Manning created the first airsteps in 1935, and the Lindy Hop soared.